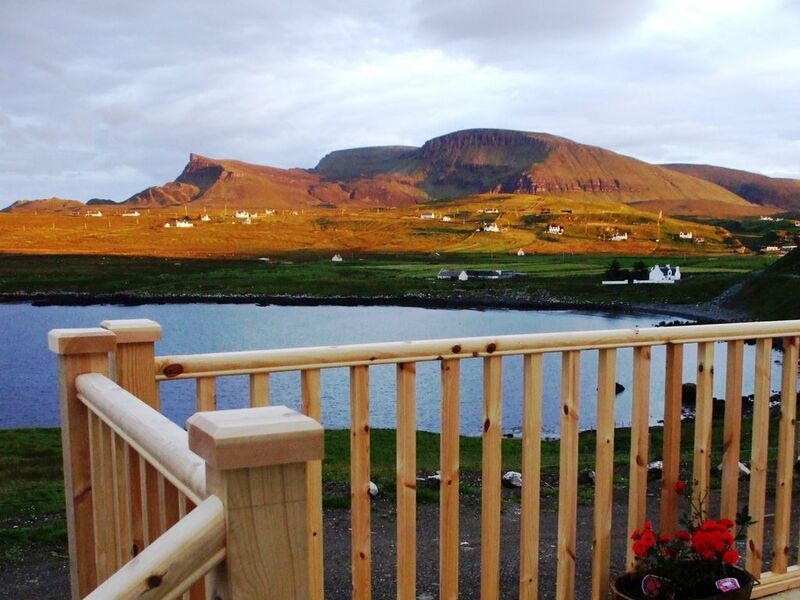 Aird Cottage, North Duntulm is located near the most northerly point on the Isle of Skye's Trotternish Peninsula and is in a crofting community bordering the shores of Kilmaluag Bay. The Trotternish Peninsula has some of the most spectacular scenery on the island. The area is one of great natural and rugged beauty with views across to the mainland. Driving up to the cottage from Portree you will pass famous landmarks such the Old Man of Storr, the basalt rocks of Kilt Rock and the Quiraing. Aird Cottage lies next to the sea shore and offers unrestricted sea views across Kilmaluag Bay to the mountains of the mainland and the bay of Gairloch. Originally built in 1920, the cottage is a stone built croft house which has been modernised to an excellent high standard. A sun lounge has been added to further enjoy the panoramic stunning views seen from cottage. Aird Cottage is the ideal tranquil holiday base whether it be for pure relaxation or activity filled days. Guide books and maps are provided to help you choose your preference. Areas of interest in this area alone include Kilt Rock, Duntulm Castle, The Skye Museum of Island Life, Flora MacDonald's grave and many galleries. The island is yours to explore. The cottage is very well equipped and comprises of sun lounge, living room, kitchen, bathroom, 2 bedrooms (one double and a twin) and a large separate utility room. The cottage also has wireless broadband. The Village of Uig and the Western Isles Ferry Terminal is only 7 miles to the southwest and the village of Staffin is also 7 miles to the southeast and has good local services including village shops / post office and cafe / restaurant. The Island's capital Portree is some 23 miles to the south and here you will find all the facilities you would expect of a busy town including, restaurants, leisure facilities, cinema / theatre and selections of shops and supermarkets. The Cottage is available to let all year round. Sorry, no smoking or pets. Very cosy cottage, furnished to a high standard and overlooking the sea. We couldn’t have hoped for a lovelier place to spend our break! Fabulous location and very homely cottage . Both my husband and I were over the moon thrilled with the three days we spent at this perfect location. We were greeted by the sheep at the front gate which let us know we were going to have a true Scotland , Isle of Skye experience. Not only are the views stunning from this location but the cottage ammenties were perfect. Of course we lucked out on gorgeous weather and were able to enjoy the sun porch and the facilities. The owner has thought of all the comforts for the guests and the kitchen had all the necessary supplies we needed. My only regret is that we could have stayed a few days longer as it would have been a great base to go visit one the islands. I hope we can come back again some day and if you are fortunate to stay here I am sure you will treasure the experience as much as we did. Absolutely perfect! Aird Cottage had everything we needed; comfort, beauty, location and great people! I highly recommend Aird Cottage to those who thrive on nature, the ocean and stunning beauty. Thank you Laura. Very glad you enjoyed your stay. 1A Sauberkeit, Ausstattung ließ an nichts mangeln, wir wurden sehr herzlich empfangen und kommen gerne wieder. Vielen Dank Elma Wood, dass wir in Ihrem großartigen Haus sein konnten! The Trotternish Peninsula has some of the most spectacular scenery on the island where you can enjoy the dramatic land forms including sea cliffs, stacks, sea caves and waterfalls. Whether your interests lie in photography, walking, fishing, geology, galleries, nature, sport or just getting away from it all, the Trotternish area has it all. -Old Man of Storr – 200 ft rock pinnacle - the views and rock formations here are dramatic. -Kilt Rock and Mealt Falls – This is a 200 ft sea cliff (with waterfall) which has the appearance of pleats in a tartan kilt. There is a viewpoint here. -The Quiraing – either walking or driving. -Trotternish Ridge walk - High level walk. Spectacular views throughout. -The Skye Museum of Island Life – the thatched cottages show island life in the nineteenth century. -Ceumannan – Staffin Ecomuseum is a museum without walls. -Staffin Museum - local geological and fossil specimens, as well as representative artefacts illustrating the prehistory and social history of Trotternish. -Flodigarry Country House Hotel – award winning hotel with excellent meals using local produce. -Trotternish Art Gallery – a short walk from the cottage, you will find Susie and Bill Lawrence who are photographer and artist respectively. -The Isle of Skye Brewery – visit and sample the local beers in Uig. -Uig Pottery – why not try making pottery yourself? -Fishing and Boat trips are available in Staffin – visit the seal colony at Flodigarry Island and see if you spot any whales or dolphins. -Single Track Art Gallery & Expresso Bar - great coffee and cakes a mile from the cottage. If all these activities are not enough, the island offers a variety of other interests including a Horse Riding Centre, Talisker Distillery, Dunvegan Castle, various galleries and many more attractions.